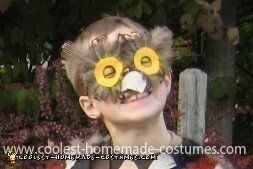 My son wanted to be an owl for Halloween so we looked online for ideas (including coolest-homemade-costumes.com) and this Homemade Owl Costume is what we came up with. I started with a brown sweatshirt. Cut out lots of feathers from different shades of brown felt. I did small and large feathers. Then I hot glued them onto the sweatshirt in rows alternating a row of large and a row of small feathers. Then I glued some actual feathers that I found at Joann Fabrics on the shoulders. I found a template online for wings and put 4 different colored wings on the arms along with some brown fabric hanging down from the sleeves. For the mask I just started with a basic black mask base found at Joann Fabrics then glued feathers on with yellow rings cut from felt around the eyes and a triange shape on the nose for the beak. 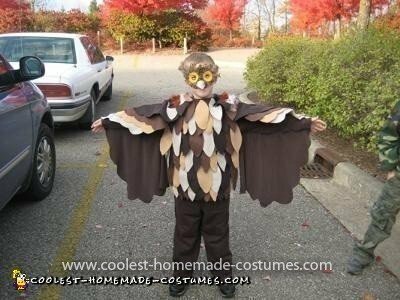 I was looking through different stuff for some ideas on where to start on making an Owl Costume for my 6 year old daughter.Her school is doing a nativity play called Born in Our Barn, where the animals that were in in the stable the night Christ was born tell the Christmas story. My daughter is the wise old Owl. I just loved your costume, it looks fantastic and as a non sewer it looked quite easy to make. You’ve given me the inspiration to have a go myself rather than buy one from a shop.